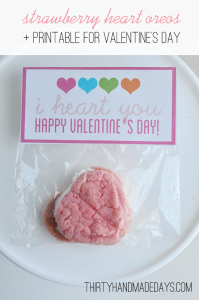 "" The Preppy Strawberry: What are you creating for Valentines Day? What are you creating for Valentines Day? Tuesday, is Valentines day which means making Valentine cards for school and of course creating a Valentines Day Box! I can remember as a kid decorating a plain shoe box and then remember kids coming with all of these cute boxes that sometimes a Dad engineered to do something crazy. This being Lilly's first official year in school I asked her what she wanted to make for her Valentine's Day Box. After tossing around several ideas she said an Owl. So my creative wheels started spinning immediately as to how I was going to create the owl valentine box. Ta Da -Here's our finished Valentines Day Box! For a class treat, we are making the mustache and lip sucker- Jolly Lollies you can find the idea over at Family Fun. I'm also attempting this evening the Strawberry Oreo Cookies, I found over here at Thirty Handmade Days. How cute are these cookies? I just finished baking mine and let me just say I need another round of practice on the making the heart shape!! Let's just say my hearts --> Epic Fail!! At my house w will be having just plain round or deformed strawberry cookies! LOL But so far my family told me they are the best cookies ever! So they might not look as cute as the heart cookies at Thiry Handmade Days but they taste pretty awesome! Now I need to start thinking about what I can make for dinner?! The only one thing I know is that it needs to be in the crock pot!!! Any suggestions??? Because by the time I get home from work, school valentines day party, and picking up my daisy troops Girls Scout cookies the last thing I'm doing is cooking! !